An invitation for two people to bring themselves physically, emotionally, and spiritually into a deep level of honesty, trust, and intimacy. That sounds like a lot of fun! But anytime you bring base notes of vanilla essential oil to set the foundation of sweetness and heart notes of gardenia together, you're going to have passionate and romantic moments together. Whether it's body butter or body oil, your skin will experience the richness of them both and you and your partner will experience just how great they make your skin feel. 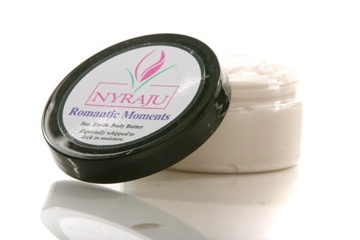 Click the button above to Order your Jar of Romantic Moments Body Butter Now! I didn't believe Juliette when she said this scent had been known to ruffle a few sheets. I thought it was sales talk so I tried it wanting to prove her wrong. I bought the body butter and she scent a sample size of the body mist spray. Well let's just say that I was the one that was wrong. From the time I stepped out of the tub and spread the butter on my body and hit the mist once or twice I knew this would be a winner. I never liked vanilla in anything especially in body scents. They were always too sweet for me but I got a sample pod of body butter with an order. I threw it in my purse thinking I'd give it to my niece. But I'd washed my hands at work one day and needed something to remove the ash so I used the pod of butter. For me it was like heaven on earth. My body chemistry loves this blend. It smells so good on Me! Never say Never.